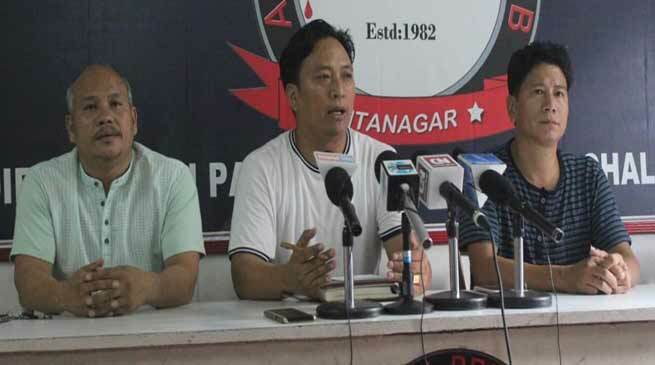 Following several criticism in social media that IMWA is backing, and indirectly giving shelter to non-ILP holders under itanagar market area, the Itanagar Market Welfare Association (IMWA) on Tuesday clarified that it only appealed AAPSU in media that while carrying out the drive, ensure that genuine businessman with valid ILP cards are not harassed in the name of ILP checking. Stating it wholeheartedly supports the Operation Clean drive being launched by AAPSU, its president, Yumlam Achung recalled few past incidents allegedly manhandling and harassing of IMWA members and bsiness houses in the pretext of ILP checking. In a press conference, Achung said that the motive behind convening the PC is to clear the misconception among public that IMWA is against the AAPSU move. Categorically reiterating that it fully endorsed the ILP drive being launched by Apex student body and district administration, the association informed that following publication of the final draft it also conducted few ILP checking drive within its jurisdiction and detected more than 35 violators, which were later handed over to police. The IMWA team further assured that they are keeping a close watch on movement of suspected people and their activities in the market and is always ready to help district administration and AAPSU in their effort to drive out the undocumented immigrants from state.